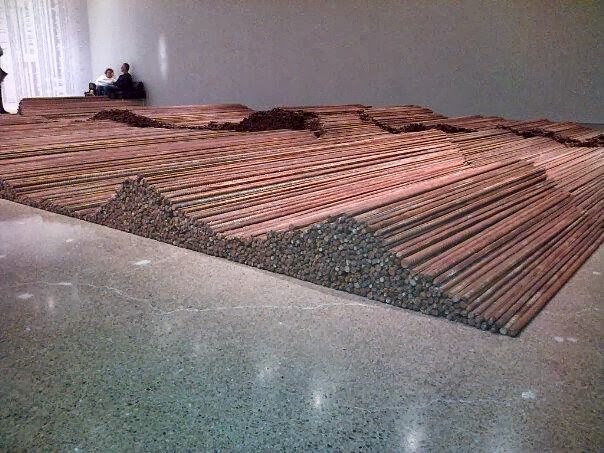 Eat Drink Paint • Kim Rempel: Ai Weiwei at the AGO! And Bowie too. Ai Weiwei at the AGO! And Bowie too. I know it's been a week since I posted. Here's the deal. After loving Monday's painting I enthusiastically jumped into Tuesdays only to work on it a FULL WEEK and gesso over the whole thing this afternoon. Ugh. Why is it that so often you do something you love only to be followed by a massive block? So instead I will post about my gallery trip to the Art Gallery of Ontario Friday. I saw the Ai Weiwei (pronounced "I wayway") exhibit "According to What?" followed by the David Bowie exhibit "David Bowie is". Both were fabulous. I like Bowie's music but after seeing this exhibit I appreciate him on a whole new level. If you are a Bowie fan you will be in heaven. It's very cool! 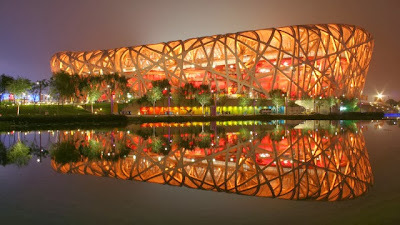 So onto Ai Weiwei. 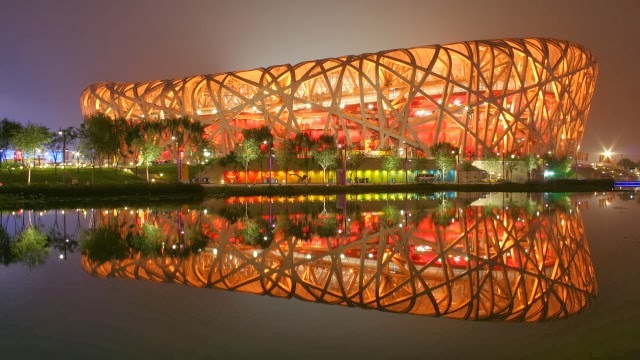 Weiwei is a Chinese artist/dissident and was the creative consultant for the Bird's Nest Stadium at the Beijing Olympics in 2008 (Sorry. Could not find a photo credit for the above photo). I think that's a good jumping off point that most people will remember. Anyway, I heard Weiwei being interviewed twice by radio culture god Jian Ghomeshi and I was intrigued. His exhibit did not disappoint. If you are going to see it I suggest watching the documentary Ai Weiwei: Never Sorry (which I have yet to see) or for a quick interview/overview check out his compelling interview with Ghomeshi (which I have seen, twice). Here are some of the highlights from the AGO. I snapped the pictures with my phone so forgive the quality. These are 3,200 porcelain crabs. In November 2010 Chinese authorities demolished Ai's new studio in Shanghai. 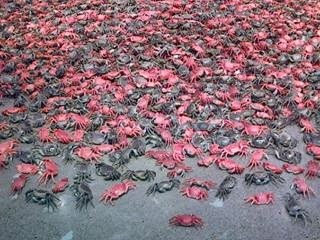 In response, Ai invited guests via Twitter to a feast of 10,000 river crabs to protest the government's control of information. Placed under house arrest for his actions, he was unable to attend his own feast. He xie, the Chinese word for "river crab" also sounds like the word for "harmonious", which is part of the Chinese Communist Party slogan: "The realization of a harmonious society." The term has come to refer to online censorship and the restriction of individual freedom of expression in Chinese society. This is a close-up taken through the opening of one of the wooden chests (you see the subsequent chests/openings through the first opening). Ai built these chests from huali, a precious and highly desirable wood from the Chinese quince tree. He has cut four circular openings into each chest, transforming them from functional pieces of furniture into pure artworks. 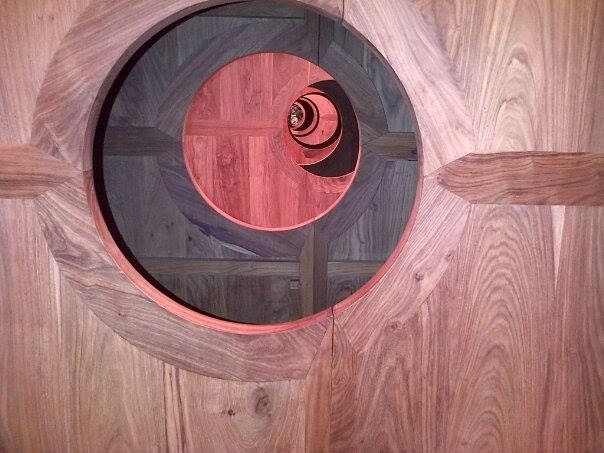 The openings align so that they show every phase of the moon to visitors who walk through the installation. Salvaged, straightened rebar from the collapsed schools of the 2008 earthquake that hit Sichaun, China. 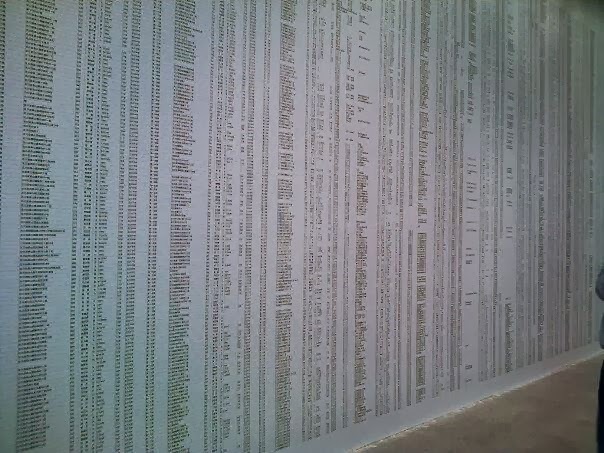 Weiwei honours the dead school children by listing their names on sheets that fill an entire wall. 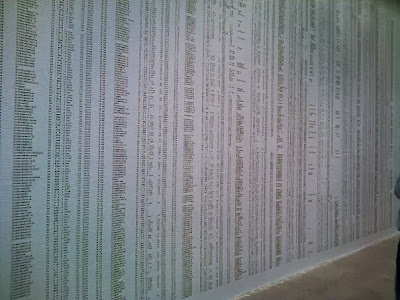 Weiwei collected and published 5000+ names against the will of the government. And paid a price. 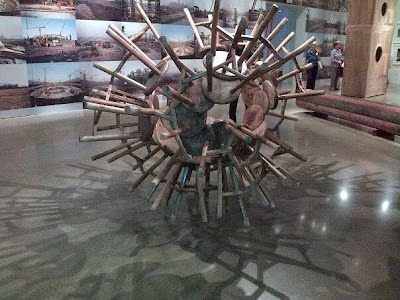 Wooden Stools sculpture by Ai Weiwei. If you have a chance, try to see this exhibit. It is so powerful and moving. 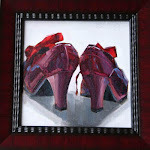 My photos aren't great but you can do an online search to see stunning pictures and learn more about his works. Congrats on your DPW pick Kim , and your prosperity! This post is amazing! Thank you so much for sharing this with us! Congratulations on The Breath Thief - you know how much that painting resonates with me. Glad to see others feel the same way!